If you are looking for Retin-A (aka Tretinoin) over-the-counter alternatives, because you don´t like the hassle to get a prescription (although I do have tips how to get your hands on Retin-A without a prescription), find it too expensive or maybe Retin-A is simply too strong for your sensitive skin, then you are in luck! Because I have today some great Retin-A over-the-counter alternatives for you! Let´s get this straight: why is Retin-A so hyped on in the mature beauty community? Because it exfoliates the skin and therefor can get rid of wrinkles and fine lines. The magic is in the chemical exfoliation. So here are my top 5 products that will also lead to chemical exfoliation! Don´t be confused, if your skin might actually feel dry and flakey if using these products- this is actually just the process of getting rid of the top layers of your skin. Get it? 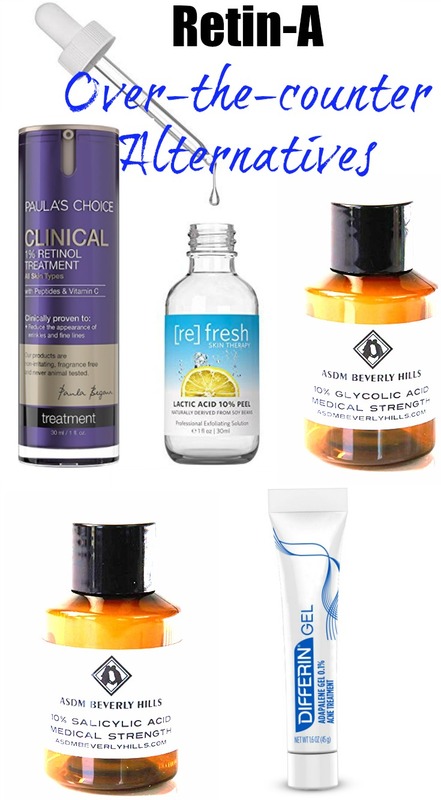 Just like with Retin-A, always start slow with any of these products, to see how your skin reacts. Try it out once a week and slowly move up to 2 or even 3 times a week. Probably one of the highest Retinol serums out there. Retinol is actually just a scientific name for Vitamin A and is basically the little (natural) sister of Retin-A. This clinical strength formula absorbs quickly & delivers immediate powerful results. Vitamin C, Vitamin E, Hyaluronic acid & peptides combined with a high dose of retinol to deliver advanced anti-aging results. This is a great product for "beginners" that have never experienced a chemical exfoliation! Glycolic acid is a naturally occurring fruit acid known as AHA (Alpha Hydroxyl Acids). Glycolic peels help to rejuvenate skin by loosening the bond that holds dead skin cells on the epidermis. This stimulates new growth of skin and removal of old, dead, dull skin. If you have never used a Glycolic Acid, please read my tips how to do a chemical peel at home. And PLEASE!!! DON´T EVER USE A HIGHER PERCENTAGE THAN 20%! THIS CAN ACTUALLY BURN YOUR SKIN. START LOW (SUCH AS 10%) AND WORK YOUR WAY SLOWLY UP. Lactic Acid (AHA Alpha Hydroxy Acid) is proven to increase skin’s natural collagen production to erase wrinkles and plump fine lines. This can also help to fade age spots and tighten skin. Lactic Acid is also a great way to start a chemical exfoliation for sensitive skin, as it is very gentle. Please don´t ever use more than 20%, as this can be very dangerous (see above Glycolic Acid tips). Salicylic acid (also: BHA Beta Hydroxy Acid) is also great to control sebum production, kill acne causing bacteria and deeply cleanse pores and therefor a great choice for our ladies and gentlemen that also (besides the wrinkles) suffer from acne breakouts or have oily to combination skin. Again: stay below 20%!!! The first over-the-counter Retinoid available that includes Adapalene, which is the synthetic form of Retin-A. This (just like Retin-A) is actually made to get rid of acne, but it might help to get rid of wrinkles too, as well as reduce the risk of scarring and hyperpigmentation. I have tried it for 4 month and here is my complete review. Personally I think that this might be MAYBE a good choice for those that have VERY sensitive skin. You might be also interested in reading how to start Retin-A without irritation!